We like to comment on tech news, environmental and consumer policy, and community. And we love a good conversation too. 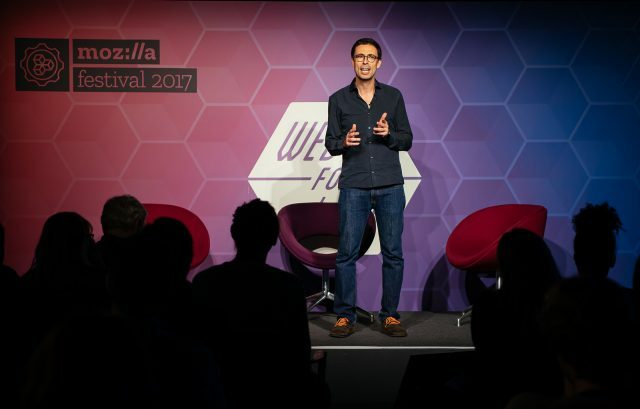 On Saturday, Restart co-founder Ugo Vallauri spoke at Mozilla Festival (“MozFest”) 2017: the world’s leading festival for the open internet. Mozfest gathered together advocates for a ‘healthy internet’, which increasingly encompasses a whole host of objects from mobile phones and laptops to the expanding Internet of Things. One of the things that we took away from the two days of talks and workshops was that many discussions touched on “last mile” access to under-served communities, especially in relation to broadband. The need for good local infrastructure is very close to our work. We started thinking about how we might feature local platforms for connectivity at our events where participants can share documents, software, videos and games. Projects such as PirateBox (a ‘portable offline internet’) provide some exciting potential solutions in this regard. It was also great to see more diversity this year. We were happy to meet the organisers of Afrotechfest: a two-day tech festival by and for black people of African and Caribbean heritage coming up in January next year. Circulating, participating and listening we heard loads about algorithms, and algorithmic decision-making and what this will mean for our lives. One point of concern is that CO2 literacy among the attendees of Mozilla festival seemed very low. At Friday’s Science Fair we played the game ‘guess the embodied carbon of the gadget’ (as featured on one of our past radio shows) – and found that many struggled to conceive of the impacts of gadget use at scale. Privacy, rights and security still very much dominate the “bandwidth” of this community. Ugo spoke about how embodied carbon and the growing environmental impact of e-waste is one of the main motivations for simulating a global repair movement. He told the story of his cherished Pebble watch: a birthday present from his wife, which stopped functioning shortly after its warranty had expired. When he tried to seek support from the manufacturer, Ugo found that the company had been bought by Fitbit. After one final software update, Pebble owners around the world were left in the dark as to what to do when their watches broke down. When Janet and Ugo hosted the first Restart Party five years ago, it became immediately clear that their frustration with obsolescence in electronic items was shared by many others. “I’ll never forget the woman who had cycled with her printer on her bike for five miles to get to this place because she was too frustrated to give up on her printer”, said Ugo. Obsolescence is increasingly a problem of both hardware and software, as objects become smaller, smarter, and harder to fix. We get easily excited about plans for increasingly advanced technologies into the future, Ugo explained, but do not put enough thought into making sure the ones we have now last longer than just a couple of years: “What’s the point of being able to repair a product if the software that the product runs on will ultimately make it useless? This isn’t some future dystopia – it’s happening here and now.” And discussion of this is starting to happen in the “Internet of Things” community assembled at Mozfest. As citizens and consumers, we are all complicit in this problem. But there’s a lot we can do. Ugo’s presentation ended with a call to action, which definitely had good response at Mozfest. The task ahead of us is big, but collectively we can all make a difference: the simple act of repairing a broken lamp can become a political gesture. As the repair movement gathers steam, we’ll be able to convince manufacturers, regulators and designers to jump on board and say no to unnecessary waste. “Internet health” has multiple, connected meanings. And the crisis in trust goes far beyond privacy concerns, it reaches deep into other connected institutions: electronic supply chains, threats to the “right to repair” and recycling systems. Voice-controlled home assistants are being sold in the millions: but they raise questions about privacy issues, product disposability, and machine learning.